LOS ANGELES, October 1, 2012 — Businesses along the June 2013 CicLAvia route experienced a 10 percent bump in sales on the day of the event, a new study from the UCLA Luskin School of Public Affairs has found. The increase was greater among those businesses that engaged with CicLAvia participants such as with a vending table or music. “Active participant” businesses saw their sales increase 57 percent according to the study, with sales revenue increases of $1,356 on average compared to $407 on average for all businesses. With the eighth iteration of L.A.’s day of car-free streets approaching on October 6, the data gives business owners, residents and CicLAvia participants tips on how to make the most of the unique interactions that happen during the event. Approximately 150,000 people on foot, bikes and skates experienced iconic Wilshire Boulevard as part of the CicLAvia event on June 23, 2013. Researchers at UCLA Luskin’s Complete Streets Initiative and the Luskin Center for Innovation surveyed a representative sample of brick-and-mortar businesses along the route, comparing sales revenue and foot traffic on CicLAvia Sunday and a Sunday earlier that month. The researchers found revenues increased by an average of $407 per business—$3,122 in sales on CicLAvia Sunday, as compared with $2,715 on a typical Sunday. When extrapolated along the entire route, this translates into a total sales revenue increase of $52,444 across the 128 establishments that were open during CicLAvia on Sundays in June. “These numbers demonstrate positive gains for local businesses, but they underestimate the event’s overall economic impact,” said J.R. DeShazo, director of the UCLA Luskin Center for Innovation and principal investigator of the study. Food Trucks and Other Informal Vendors: The estimated increase in revenue accounts only for the brick-and-mortar businesses located at street level along the route that are normally open on Sundays between 9 am and 4 pm. Excluded from that figure are more than 30 food trucks and myriad other vendors that operated in designated spots along the route that day. The researchers sampled data from 14 food trucks at CicLAvia, finding that the temporary vendors averaged $1,693 in sales, for a total of $50,790 in food truck revenue that day. Several managers reported anecdotally that their food truck would not have been operating—and thus not providing tax revenues to the city—on this Sunday if CicLAvia had not happened. Businesses Not Usually Open: The average increase of 10 percent in sales does not include sales revenues for the five or more local businesses that opened specifically for CicAvia Sunday, when they would normally have been closed. Consumers Shifting Shopping Patterns: While some businesses performed exceptionally better, those that fared less well were generally loyalty businesses, such as dry cleaners and hair salons. For these businesses, their customers likely shifted business to another day of the week rather than eliminated it altogether. The study did not account for shifting of business to another day. In interviews with the researchers, business owners reported enthusiasm for the event leading to new customers. “The results tell us that local business seeking to maximize profits during CicLAvia should consider CicLAvia engagement strategies such expanding the business closer to the street with a booth, music, or CicLAvia signage,” said Colleen Callahan, deputy director of the Luskin Center. 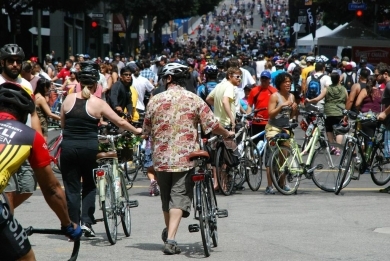 To conduct the study, researchers contacted a random sample of 128 brick-and-mortar establishments and 30 food trucks that participated in CicLAvia. Approximately 50 percent (14) of the food truck operators and a third (41) of the brick-and-mortar businesses decided to take part, providing their revenue data for both a Sunday before and the Sunday of CicLAvia. To overcome any possible selection bias, researchers also conducted head counts (as a proxy for customer business) for 33 establishments for which sales data were not available, as well as for a control group of businesses. This allowed researchers to control for overall effects not related to CicLAvia. While the small survey size prevents extrapolation to other open-street events, additional studies could determine whether the effect is similar regardless of the particular neighborhood or event. Future studies could also seek to expand the sample size by including surrounding businesses, to examine how far the “CicLAvia effect” may exist. The research project managers were Madeline Brozen, who manages the Complete Streets Initiative, and Benton Heimsath, a UCLA Luskin graduate student in Urban Planning and Fellow of the Los Angeles Sustainability Collaborative. Funding from the study come from the UCLA Center for Civil Society in partnership with CicLAvia Inc. and the Los Angeles Sustainability Collaborative, with support from The California Endowment and the Liberty Hill Foundation. A complete policy briefing and report are available at the Complete Streets Initiative website, by clicking here. Founded in 1994 and dedicated in 2011, the UCLA Luskin School of Public Affairs is a leading institution for research and scholarship in the areas of public policy, social welfare and urban planning. Based in the global metropolis of Los Angeles, UCLA Luskin develops creative solutions and innovative leaders that confront challenges in immigration, drug policy, prison reform, transportation, the environment, and other areas vital to the continued health and well-being of our global society. More at luskin.ucla.edu. The study was conducted by the Luskin Center for Innovation and the Lewis Center for Regional Studies, with a grant from the Center for Civil Society. All three centers are based at the UCLA Luskin School for Public Affairs. CicLAvia Inc. is a 501 (c) 3 nonprofit organization dedicated to promoting public health, active green transportation, public space, economic development, and community building through car-free public events. With the full support of the City of Los Angeles, CicLAvia is an innovative model for creating new public space and enriching civic life. CicLAvia is Los Angeles’ adaptation of ciclovía, a phenomenon that began more than 35 years ago in Bogotá, Colombia, where every Sunday 80 miles of streets become closed to car traffic with the goals of reducing pollution and encouraging a healthy lifestyle. The Los Angeles Sustainability Collaborative is dedicated to creating a more sustainable Los Angeles by facilitating research, informing stakeholders and providing solutions to emerging environmental challenges. To learn more, visit www.lasustainability.org.